Local husband and wife who lost their son at birth plan six Cuddle Cot donations throughout the U.S. 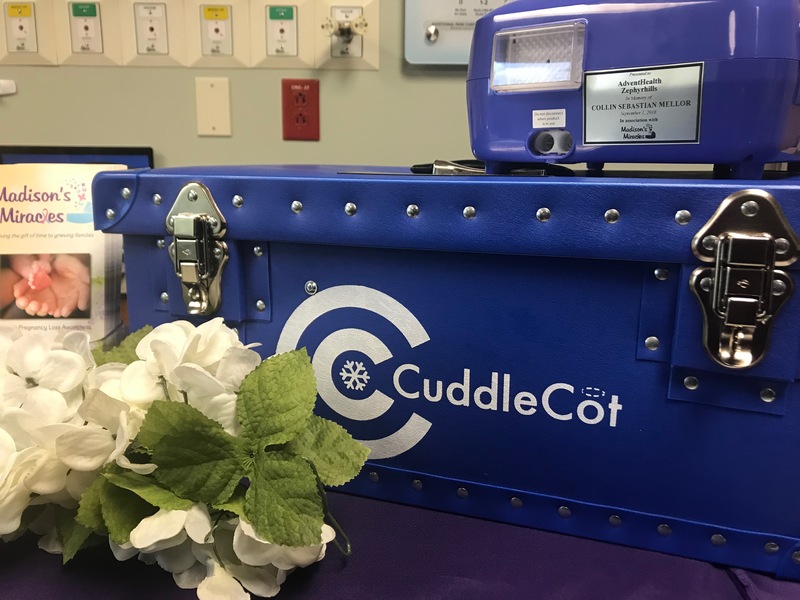 The family of Collin Sebastian Mellor has partnered with Madison’s Miracles to graciously donate a Cuddle Cot to The Baby Place® at AdventHealth Zephyrhills, in honor of their son. Collin Sebastian Mellor passed away September 1, 2018 during birth at AdventHealth Tampa. Traditionally, families only have a few hours to say goodbye when an infant passes away but the Cuddle Cot cools the baby, allowing the family to spend additional time to process bereavement. Collin’s parents, Alissa Rodriquez and Ryan Mellor, were able to use a Cuddle Cot to spend more precious time with their son, allowing time for his only bedtime story and the opportunity for his grandparents to hold him and say their goodbyes. These are moments the family shared that would not have been possible without a Cuddle Cot. 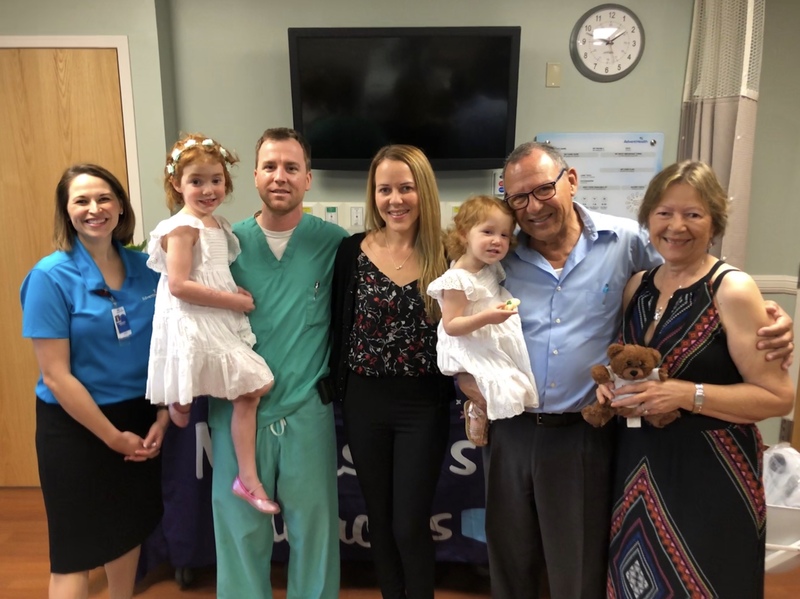 Collin’s family was so touched by their experience using a Cuddle Cot, they will donate a total of six through Madison’s Miracles, with the first being donated to AdventHealth Zephyrhills. Collin’s father is a surgeon at AdventHealth Tampa. Madison’s Miracles is a 501 (c) 3 founded by Chris and Christina Stamper following the loss of their daughter, Madison Elizabeth Stamper. Christina wanted to use her tragedy to help other families who experience loss. Madison’s Miracles is dedicating to honoring all babies gone too soon every day. For more information about the Cuddle Cot and Madison’s Miracles, please visit http://www.madisonsmiracles.org. Cuddle Cot donated by Alissa Rodriquez and Dr. Ryan Mellor in honor of their son Collin Sebastian Mellor.Cuddle Cot donated by Alissa Rodriquez and Dr. Ryan Mellor in honor of their son Collin Sebastian Mellor. AdventHealth Zephyrhills President and CEO Amanda Maggard with the Rodriquez/Mellor family during Cuddle Cot donation.AdventHealth Zephyrhills President and CEO Amanda Maggard with the Rodriquez/Mellor family during Cuddle Cot donation.